Treat yourself and a loved one to the ultimate San Francisco experience — a seaplane flight for two over San Francisco Bay. As you’re flown over the Golden Gate Bridge, Alcatraz, Fisherman’s Wharf and Tiburon, indulge in two glasses of Northern California’s finest champagne. Watch the magical light of the 'golden hour' illuminate the city and bay before the sun sinks into the Pacific Ocean. Then end your flight in Sausalito, the perfect place to continue your evening on your own with a waterfront dinner. Your seaplane tour takes off from Sausalito, a waterfront town just 4 miles (6.4 km) north of the Golden Gate Bridge. While you sip two glasses of Mumm Napa, a California champagne made in the traditional French method, enjoy a gorgeous, leisurely flight over San Francisco Bay before the sun sets. Relax during this magical time when the city and water are beautifully illuminated by the indirect light of the sun. Head out to the open Pacific Ocean and then south to the Golden Gate Bridge, soaring over the iconic red towers as you make your way toward downtown San Francisco. Fly past Fisherman’s Wharf, Pier 39 and the skyscrapers of the Financial District, and then zoom up to Alcatraz and Angel Island. Loop back to Sausalito via the picturesque bayside towns of Belvedere and Tiburon. During the 40-minute flight, watch for landmarks that your pilot will point out and snap photos through the large windows. 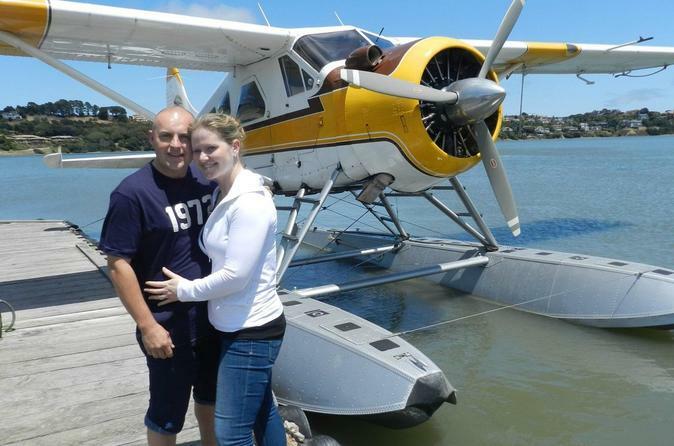 Your 2-passenger seaplane features high wings that don’t obstruct your view, making it ideal for sightseeing. Your tour ends when you land in Sausalito. From here, perhaps enjoy a romantic dinner at one of the town’s cozy restaurants or return to San Francisco by ferry (own expense; your pilot can provide info about ferry times).